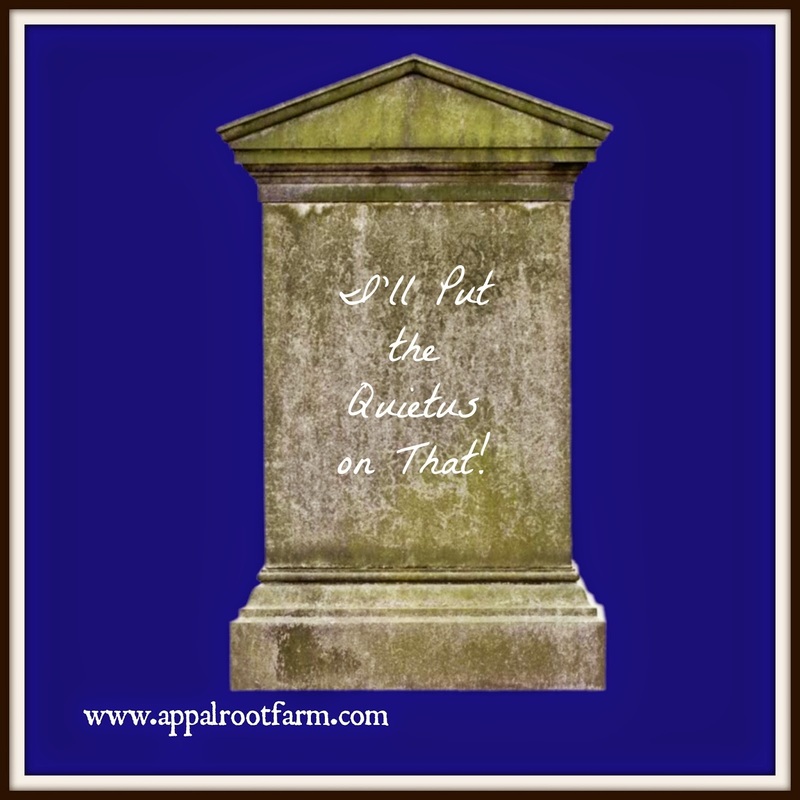 Appalroot Farm: The Day Shakespeare Put the Quietus On It! The Day Shakespeare Put the Quietus On It! Appalachia...as green as the Emerald Isle itself! 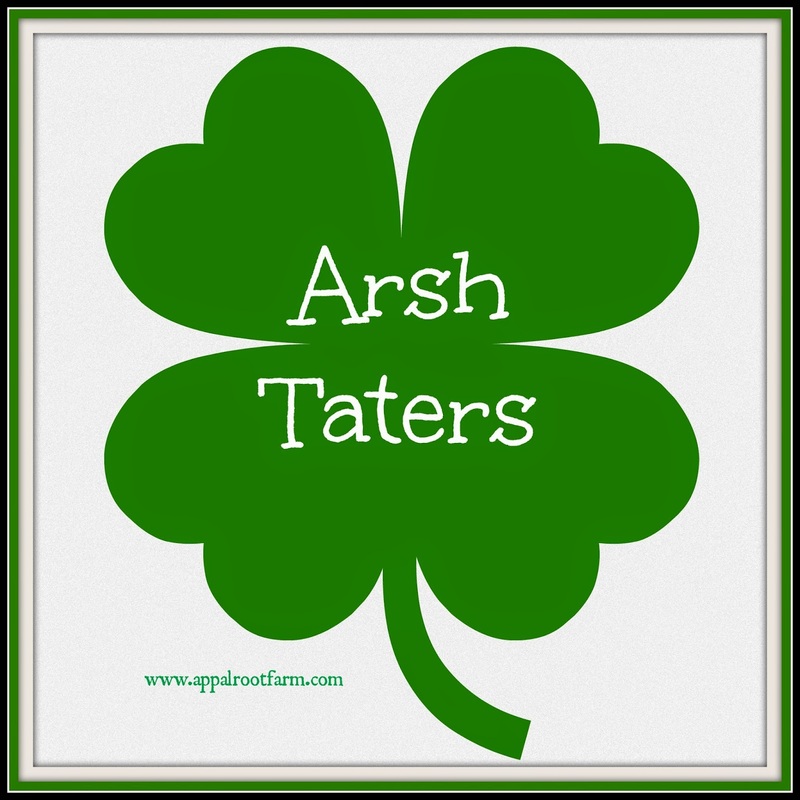 It never fails that every March 17, when St. Patrick's Day rolls around, I have thoughts of taters..."Arsh" taters to be exact. More specifically...I think about what I have oh so fondly dubbed my "Arsh" tater experience. Funny thing is, over the years I've discovered that I'm not alone in this experience...and there are enough others with Appalachian roots that have gone through this same dumbfounding epiphany that we could start an "Arsh" Taters Experience Anonymous! One evening my friend who lived across the street was playing in the front yard with me when I asked her what she had eaten for supper. Among the list of items she rattled off to me was potatoes. Not sure why I was being so inquisitive, but I asked her what kind of potatoes it had been. And her next statement nearly blew my mind...she said...wait for it..."Irish" potatoes. Time stood still, jaws dropped (okay, maybe just my jaw), the earth shook, maybe I even died a little inside... "Irish"....IIIIrish potatoes! I had spent almost my entire childhood under the assumption that white potatoes were "Arsh" potatoes. I had no idea what "Arsh" meant...but up until that moment I had believed with my whole heart that "A.R.S.H" was how you spelled them, and I had never once considered that it was just the Appalachian pronunciation of "Irish!" I didn't say one single word to her...but she probably wondered why I paused so slack jawed and stared at her for what felt like an eternity. The light bulb in my head went off instantly with her words, and the days of my sweet Arsh tater oblivion had come to a close. Little did I know at the time that this was just the first of a life-long series of dialect related "deer in the headlights" moments of realization for me. I'm sure other Appalachian migrants and their children can relate to this post. Do you have a similar tale to tell? The play was Hamlet...and the professor happened to be reading a portion of the play (Act 3, Scene 1 to be exact) out loud as we followed along in our own copies of the script. And there it was! Lord have mercy, I had heard that word my whole life...from one man: dear old Dad! Quietus. I quickly checked the definition in the footnotes at the bottom of the page to see if I was right...and sure enough, it held the same meaning as the word so often spoken by my Eastern Kentucky father. It means to put a stop or an end to something. I sat there grinning like a fool for the longest time...having flashbacks of Dad getting on our case when us kids were acting up and he wanted some peace and quiet. "If you don't cut that out right now, I'll put the quietus on it!" Dad was usually mild mannered, so when he busted out with the "quietus" phrase, we knew we were in for it! Dad...he would put the quietus on it! I had never in my life heard that word spoken in everyday conversation by any other individual outside of Appalachia...and here it was in the pages of Shakespeare! Now I don't know what a linguist would make of my little quietus discovery...probably brush it away as useless foolishness. But I sure thought it was neat! These days, most of my "language discoveries" consist of City Boy looking at me with perplexity...wondering what in the world I have just said. I have been surprised at the number of words and phrases I use that I didn't even realize were primarily Appalachian...at least according to my dear husband. 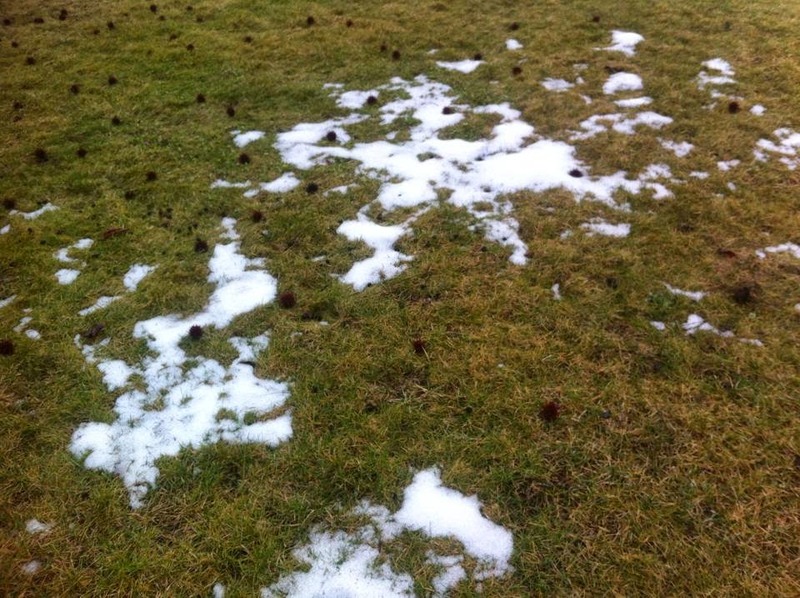 It all started when I once told him we just had a "skift" of snow. "A what?" he inquired. Up until then, I thought everybody knew what a skift of snow was...just a dusting or small amount. And as I type this right now, spellcheck is confirming City Boy's right to confusion with a big old red line under the word skift! And then there is the ongoing debate in our home over whether a footstool is to be called an ottoman or a hassock. City Boy has yet to convince me to shift to the word ottoman...so our children have grown up hearing both words. I just appease City Boy by telling him that our children are bilingual! Being bilingual sure sounds rather cultured...so that puts the QUIETUS on any possible argument! Teehee! "You're as full of notions as a dog is fleas!" 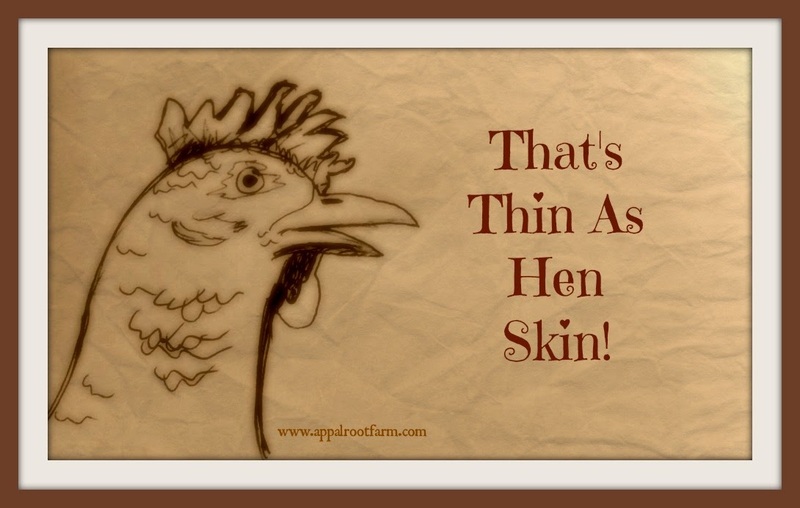 "That's thin as hen skin!" 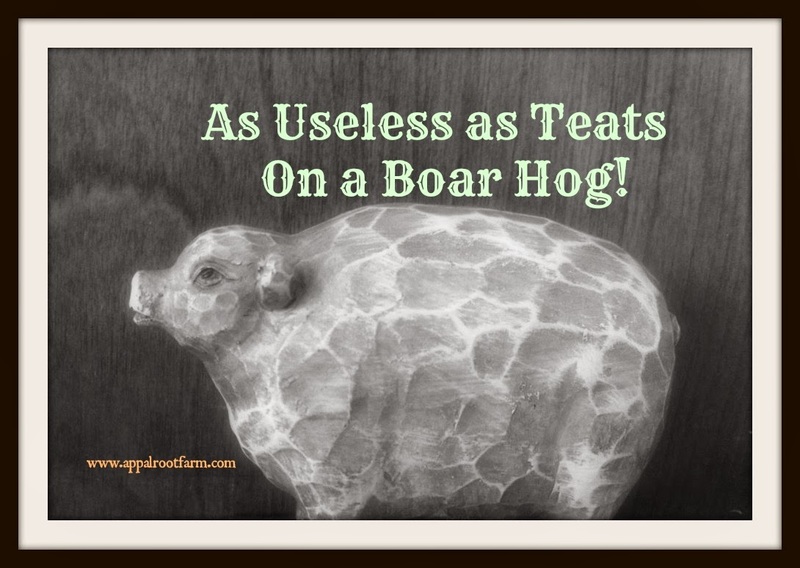 "As useless as teats on a boar hog!" And the all time favorite go-to of my Appalachian mother when I would carry on about wanting something that was out of the question..."And there's men in the pen a wantin' out!" Mom...famous for saying, "There's men in the pen a wantin' out!" Don't you just love them all?! I'm so proud to have roots in a place that has such a unique and distinct way of speech. It is one of so many things that makes Appalachia special.